Japanese studio Nendo created this for the Belgian brand Valerie Objects, a wonderful combination of form and function cutlery called “Skeleton”, which kinna fits with Halloween coming up. It’s a sculptural set of cutlery that can be hooked onto cups, plates or whatever to keep the flatware from soiling the nice tablecloth. They call it Skeleton because it’s what cutlery looks like when x-rayed (so they say). There are four pieces to the set: a spoon, a teaspoon, a fork and a knife. They feature a distinctive kink where the handle joins the head. That’s the trick in this treat. Available in stainless steel or a black PVD coating, the set comes with a dedicated stand and wall hook for display purposes. It’s not for sale yet, but will be at Valerie Objects this December for about $30 per utensil. Halloween is coming up and you should start planning your party now. 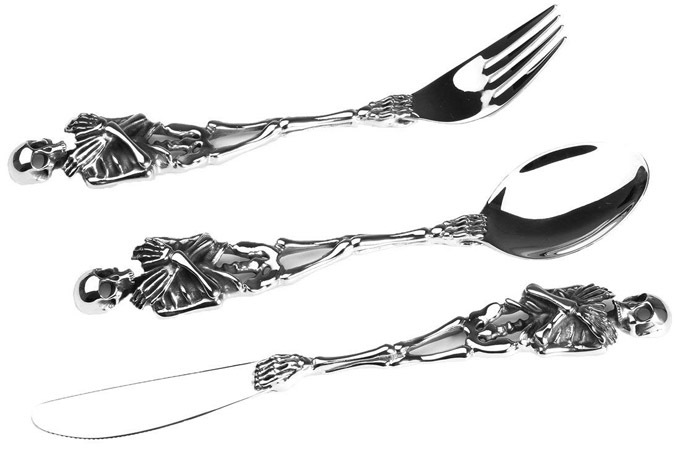 And to be honest, I wouldn’t need Halloween as an excuse to use this creepy cutlery to add a little excitement to the table. Jewelry Kingdom brings us this set called “Personality Silver Black Skull Skeleton” which is made of dishwasher safe hypoallergenic stainless steel-that is guaranteed high strength and hardness. Which will never fade and highly resistant to rust and corrosion. It is a 3 piece sets including 1 dinner fork, 1 spoon, and 1 knife. 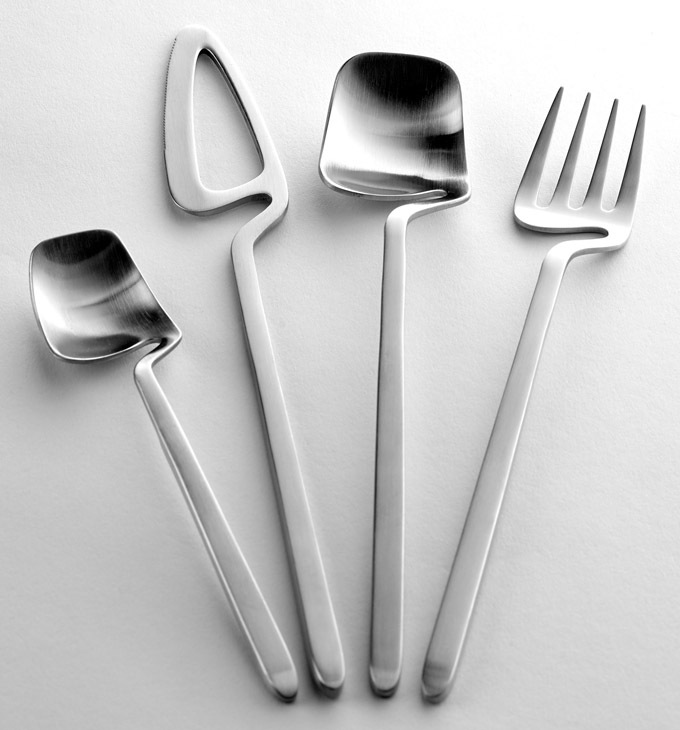 This is fun freak flatware at it’s finest! Sur La Table Silicone Ultimate Fork – It’s a really big Fork! Wow, that’s a big fork. Like, really big. How big is this colossal cutlery you ask? It’s over 10 inches long. The wonderful folks at Sur La Table bring you their “Silicone Ultimate Fork”. It’s made of food safe silicone and is heat-resistant up to 446°. It has a metal core to keep it from being a little too flexible. A very handy item to have in the kitchen but what sells me is that it will never harm your scratch resistant teflon cookware. And yup, it’s dishwasher safe. That’s fantastic flatware.